This case study focuses on the transport needs of Jones Zylon, a provider of complete meal delivery systems for correctional institutions and healthcare facilities. 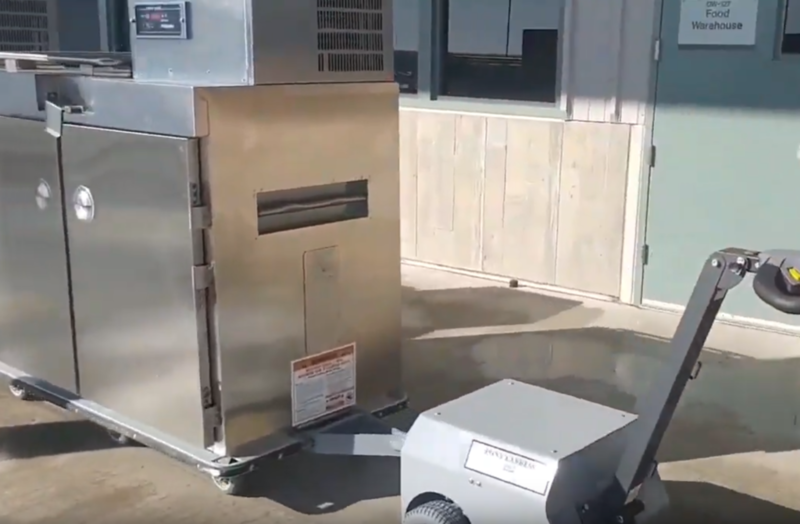 After receiving feedback from customers, Jones Zylon discovered the need for an ergonomic means of transporting their meal delivery carts safely and securely, specifically throughout correctional facilities. Jones Zylon reached out to Electro Kinetic Technologies for a tugger solution that they could provide customers as part of their meal delivery programs. Jones Zylon’s customers utilize specialized meal delivery carts for transporting hot and cold meals to inmates throughout correctional facilities of all levels. These carts are well insulated to maintain meal temperatures, and when filled with meal trays, can weigh upwards of 1,000 lbs. Pushing these carts exposes corrections staff and inmates to musculoskeletal strain and injury and causes staff to occasionally lose control of them due to their weight. Runaway meal delivery carts have occasionally caused property damage and injury when colliding with objects and people. Any proposed solution would need to be capable of towing the meal carts at a safe pace while providing excellent maneuverability through facility pathways, without causing injury to operators or bystanders. Due to the particular security needs of correctional facilities, none of the components could have removable pins, detachable cords, or standard nuts and screws. The solution must also have a keyed start. Previously tried solutions implemented by the correctional facilities included using golf carts and pallet jacks to transport the carts. All of these options were too fast and too high powered, and some would even rip the hitches off of meal carts when engaged. These alternatives also failed to provide drivers with enough control over the meal carts, causing collisions and accidents that damaged property and caused injuries. As a result, Jones Zylon sought out a safer and more easily controlled motorized solution. Electro Kinetic Technologies proposed a medium capacity tugger solution that could be easily and cost effectively customized to meet the security needs of correctional institutions. The Pony Express Medium Capacity 1062 Tugger was outfitted with a keyed start and pinless hitch to easily and safely attach to the meal delivery carts. Instead of traditional bolts and screws, torx were used to secure necessary components to the tugger, and a hard wired, 5’ long charger cord, with a polyamide strain relief connector was also installed. The tugger’s medium payload capacity allows it to tow between two and three meal delivery carts at a time in a safe, controlled manner throughout the facilities served by Jones Zylon. Additionally, the medium capacity tugger was chosen for its ability to make 45 degree turns in tight hallways and spaces, and transport carts up and down ramps, even in rainy conditions, while providing enough power to efficiently transport meal carts without sacrificing control and maneuverability. Jones Zylon has found that the tuggers provided by Electro Kinetic Technologies make convenient and effective additions to the meal delivery programs they offer, and better incentivize customers to make a purchase. Customers also report that the tugger solutions prevent excess wear on the meal carts themselves, increasing their longevity, and lowering the occurrence of lost time due to injury. The Pony Express Medium Capacity Tugger also falls within the budgetary capacity of correctional facilities, some of which are provided up to $5,000 by insurers in their state of to implement injury preventative motorized solutions. For additional information on tugger solutions for material handling challenges, contact usand a team member will help answer your questions.